Green dragon is the name of a newly cultivated fruit. It is rather big, weighs from 200 to 500 grams, and has pink or dark-red colour. The ripe fruit looks like the kohlrabi cabbage and has an oval shape. When ripe, the fruit peels as easily as a banana. Its pulp is white and gelatinous. The pulp contains many seeds that cannot be extracted. 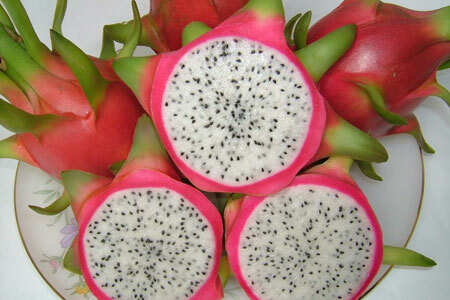 The seeds taste like cactus, giving the fruit a sweet and sour taste. Different from any other southern fruit, its harvest season is particular; fruits become available in markets in October, November, April, and May. They are more expensive in October and April, since there are smaller quantities available.